LANSING — As 42 new state lawmakers arrived in Lansing at the start of 2017, Michigan’s largest lobbying firms were busy introducing themselves. A flurry of campaign contributions followed. For the first quarter of 2017, the political action committees (PACs) of multi-client lobbying firms Karoub Associates and Governmental Consultant Services Inc. (GCSI) reported their second highest spending totals for any quarter in the last four years. The PAC of the firm Muchmore Harrington Smalley & Associates reported its highest spending total for a quarter since 2014. The firm’s PAC gave to 81 different lawmakers, a majority of the Legislature, in the 109 days from Jan. 1, 2017, to April 20, 2017, according to campaign finance disclosures. The contributions ranged from $125 to $1,000. Twenty-two of the lawmakers who received contributions were beginning their first terms serving in Lansing. Lobbying firms’ PACs tend to get their money not from clients the firms represent but from individual lobbyists whom the firms employ to work in the halls of the Capitol. The lobbyists give to the PACs. The PACs then give to the lawmakers whom the lobbyists are trying to influence. 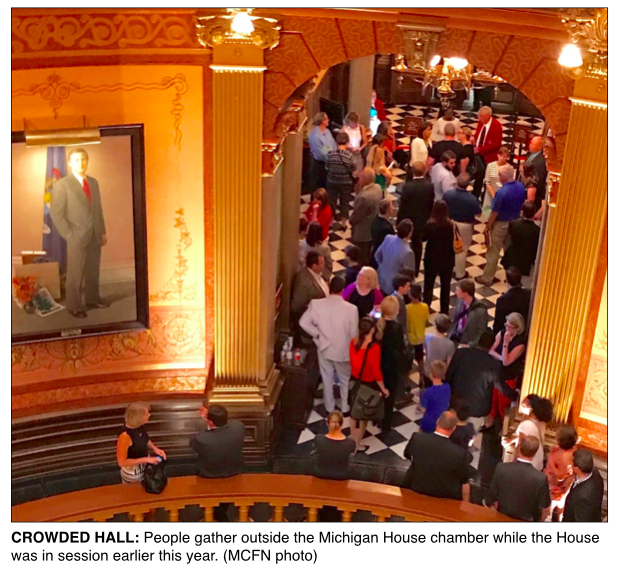 Registered lobbyists — individuals who are specifically working with state officials to sway policy decisions — have been frequent political donors in Michigan over the years, according to an analysis of campaign finance disclosures. Since the start of 2012, five-and-a-half years ago, Michigan’s more than 1,300 registered lobbyists have made $3.7 million in personal political contributions at the state level. Michigan’s lobbying laws describe these individuals as “lobbyist agents” employed by others to influence public officials. While many states place limits on lobbyists’ ability to make contributions, there is no such restriction in Michigan. 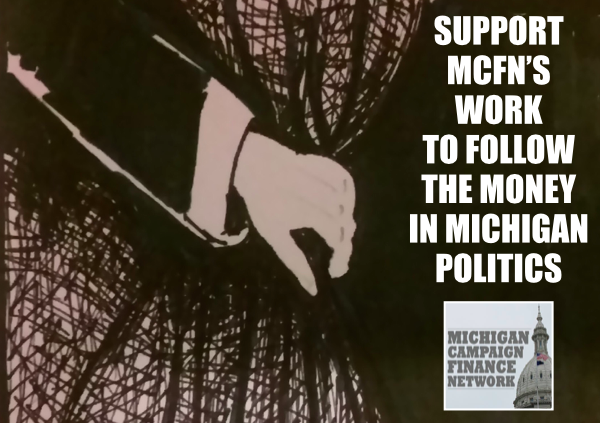 The Michigan Campaign Finance Network (MCFN) tracked more than 18,000 individual contributions from registered Michigan lobbyists since the start of 2012, an average of nine contributions a day over that time period. Many of the contributions went to PACs that collect money and then hand it out to candidates’ campaigns. But, at minimum, $1.1 million of the $3.7 million went directly from lobbyists’ pockets to candidates or sitting officials’ fundraising committees. Of the 1,352 individual lobbyists MCFN tracked, 723, about 53 percent, had made at least one contribution since the start of 2012. About 31 percent, 421 lobbyists had given at least $1,000. About 6 percent, 88 lobbyists, had given at least $10,000. The political giving of lobbyists in Lansing demonstrates the merger of two trends. Groups are spending more than ever on lobbying: 2016 was a record year with about $40 million spent on lobbying in Michigan. Meanwhile, the cost of campaigns in the state continues to rise: 2016 saw the most expensive state House races in state history. Those benefiting from the lobbying boom are helping contribute to increased campaign spending. They’re also helping financially support the lawmakers they’re being paid to influence. While registered lobbyists have given more than $1 million directly to candidates or lawmaker-led committees since the start of 2012, the majority of their giving has gone to PACs first. For instance, registered lobbyists have supported their lobbying firms’ PACs. Half of the state’s 10 largest multi-client firms — firms that lobby on behalf of a wide variety of interests from businesses to trade associations to nonprofit causes — maintain their own PACs. The Muchmore Harrington Smalley & Associates PAC has received about $363,075 from registered lobbyists since the start of 2012, according to MCFN’s tracking.The Karoub PAC has received about $129,024. The GCSI PAC has received about $78,645. The three PACs or the firms’ lobbyists have contributed to the campaigns of the majority of the current Legislature. The Muchmore Harrington Smalley & Associates PAC or the firm’s lobbyists have given to 125 out of 146 current lawmakers’ committees. The GCSI PAC or the firm’s lobbyists have given to 105 current lawmakers’ committees. The Karoub PAC or the firm's lobbyists have given to 88 current lawmakers’ committees. Often, these contributions have come in the form of purchasing tickets to fundraising events. 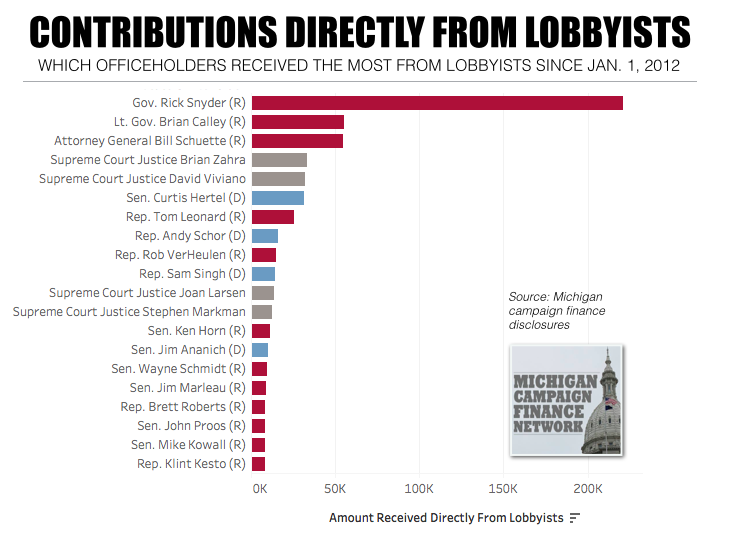 Individual lobbyists’ direct giving to candidates or state officials has focused on the highest ranking state officeholders and lawmakers who represent the Lansing area, where many Michigan lobbyists reside. While Gov. Rick Snyder’s campaign doesn’t accept contributions from PACs, he’s been supported heavily by lobbyists who work for interest groups that control the state’s largest PACs. His committees have received $221,306 directly from lobbyists since the start of 2012. That total is more than any other state official, according to MCFN’s tracking. Taking money from lobbyists is a bipartisan venture. The campaign of Democrat Mark Schauer, Snyder’s 2014 opponent, received $47,128 directly from lobbyists. Lt. Gov. Brian Calley has received $55,484 from registered lobbyists since the start of 2012. Attorney General Bill Schuette has received $54,659. The top recipient of direct lobbyist dollars in the Legislature has been Sen. Curtis Hertel, a Democrat from Meridian Twp., who represents Lansing in the state Senate and whose committees have received $31,483 from registered lobbyists. Asked about the total, Hertel noted that many lobbyists reside in his district. “I happen in to live in the district where most of them live,” he said. In second place is House Speaker Tom Leonard, a Republican from DeWitt Twp., whose committees have received $25,773 from registered lobbyists since the start of 2012. This ranking includes only contributions directly from registered lobbyists and doesn't include contributions from PACs funded by lobbyists. According to MCFN’s tracking, lobbyists tend to focus their contributions on lawmakers who’ve already been elected or are heavy favorites to win. Less frequently, they get involved in competitive races. In those situations, their contributions have tended to go to candidates who are favored to win or to candidates with past connections to Lansing. For example, in 2016, Lansing lobbyists gave heavily to former lobbyist Republican John Griffin, of Jackson, who was running for a seat in the Michigan House. Griffin’s campaign received 43 contributions, totaling $13,000, from lobbyists, according to MCFN's tracking. He lost the primary election to Republican Julie Alexander, of Hanover. Alexander’s campaign didn’t receive a contribution from a lobbyist until after she won the primary, according to MCFN's tracking. Unlike many states, Michigan places no restrictions on individual lobbyists’ ability to write campaign checks to the state officials they’re being paid to influence. According to the National Conference of State Legislatures (NCSL), 15 states generally prohibit contributions to lawmakers while the Legislature is in session, and 14 other states specifically prohibit contributions from lobbyists while the Legislature is in session. 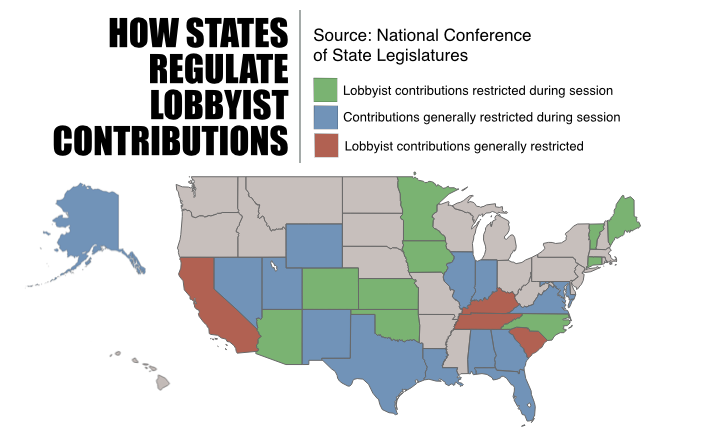 California, Kentucky and South Carolina restrict contributions from registered lobbyists at any time, according to NCSL. North Carolina’s ban on lobbyist contributions while the Legislature is in session and California’s more complete ban have both withstood legal challenges in the past. But last month, a federal judge struck down Kentucky’s long-standing ban on lobbyists’ campaign contributions to state legislators. Judge William Bertelsman, from Kentucky’s Eastern District, said the ban was too broad a restriction on lobbyists’ freedom of speech. “The court concludes that Kentucky’s complete ban on all campaign contributions from lobbyists is unconstitutional because there are less restrictive means available that may achieve the same goal, such as setting an annual limit or limiting the ban to the active legislative session,” Judge Bertelsman’s decision said. “It would be a disservice to the citizens of the Commonwealth to roll these reforms back,” Kentucky Chamber President and CEO Dave Adkisson said.